We are the only early learning center and preschool in the area that offers extended morning and evening hours, giving parents more flexibility at work! And automatic payment process, so you never have to worry about your bill. We give you a break….when is the last time you had a FREE SITTER for your date night? Strong values are established and maintained at our preschool and educational day care center. We have a pass code-protected entry door, which only allows authorized persons to enter the building. Any unknown person will need to be let in by preschool staff, ensuring our little ones are safe and secure all day long! We give ALL children our screenings to ensure our program focuses on each individual child’s needs and ability. Our preschool and day care center has programs focusing on school readiness—at all ages—with the South Dakota Early Learning Guidelines. We bring the best quality to our center! That’s right! NO more paper to lose. Our team logs your child’s meals, naps, diapers and activities into our free “Kidreports” app, and you have instant access on your smart phone! How cool is that? We are the ONLY childcare center in South Dakota to have the Eco-friendly, ZONO Cabinet as our weapon in the fight against infectious diseases and viruses. The ZONO Cabinet uses no harsh chemicals to sanitize! PEACE OF MIND WITH OUR WEBCAMS! We are the ONLY preschool and childcare center in the area to offer parents LIVE STREAMING PB&J TV WEBCAMS! We want your family to stay connected and for you to absolutely 100% KNOW that you made the BEST child care choice! WE JUST LOVE KIDS!!! It is evident in everything that we do, every activity that we plan and every interaction we have with our children! We absolutely love making new friends, so we hope Leap 2 Learn is at the top of your list! If you want the best possible early learning experiences for your child, there is no need to look any further! 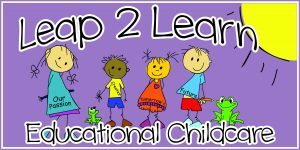 Become part of the Leap 2 Learn Family today!